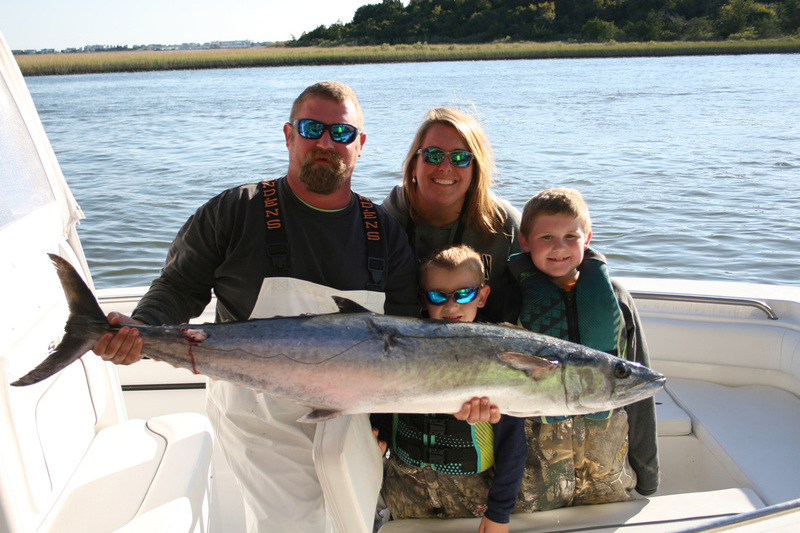 Captain Justin Hill is the owner and operator of Family Time Fishing Charters. Captain Justin has spent most of his life on the water. From a young age he grew up in Emerald Isle and Atlantic Beach, fishing on the Crystal Coast of North Carolina. Once he graduated from high school, he began commercial fishing out of Morehead City until he joined the United State Marine Corps. During his time in the USMC, Captain Justin became a Chief Coxswain. While stationed in Camp Pendleton, California, Captain Justin was also able to pursue his passion of being on the water. He spent his free time mating on charter boats out of Ocean Side Harbor in California. After the USMC, Captain Justin began tournament King Mackerel fishing on the Southern Kingfish Association Trail. Captain Justin, along with his wife and their two sons, have consistently placed in the Top 5 of this competitive circuit. Captain Justin spends a great amount of time on the water to ensure that you have a fun and successful fishing trip with Family Time Fishing Charters! Captain Justin enjoys sharing his wealth of knowledge of sport fishing with others and hopes to ignite passion for the sport for future generations. Captain Justin Hill is fully licensed through the United States Coast Guard and insured for your fishing adventure.